Have a question on Nano? Nano is available in 8 different colors - Pearl White, Sangria Red, Meteor Silver, Dazzle Blue, Damson Purple, Royal Gold - Tata Nano, Persian Rose and Espresso Brown. Watch latest video reviews of Tata Nano to know about its interiors, exteriors, performance, mileage and more. Tata Nano is the first and the most affordable car ever introduced in the Indian market. The strategy behind developing this car is to give a funky looking and practical vehicle at an astonishingly low price for the budget conscious car buyers in the country. First launched in the year 2009, the Nano received its first update in 2011 and then the next generation model GenX in 2015. The tiny car has witnessed many transformations before becoming fully mature. The latest GenX model has gone through a whole lot of changes including the exterior styling, interior design, and mechanical changes. All these alterations have been made to keep the car stay up in the competition. The basic silhouette of the car has remained unchanged for almost a decade. It might not attract many but it serves a practical purpose for the everyday commuter. 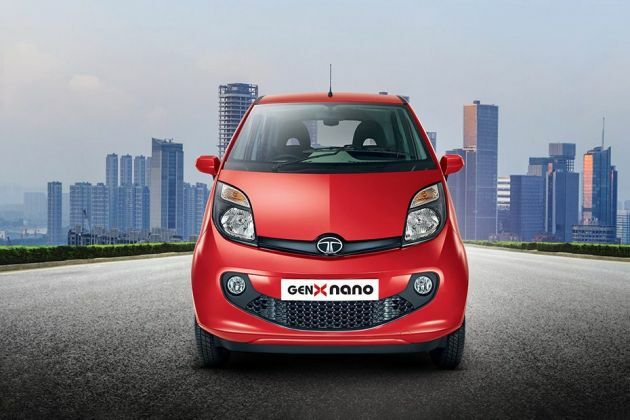 At the front, the new GenX nano gets smoked headlamps similar to the one we see in Bolt hatchback. The headlamps are connected through a black strip with the Tata badging taking the centre stage. The smiling grille also houses fog lamps on the two corners. At the side profile, the tiny 12-inch wheels do make some sense on the road. At the rear, the customer feedback has forced the company to add the most wanted feature in the form of door hatch, giving access to the boot. The rear bumpers are also redesigned as you would expect in a facelift. The car is available in five different colour options including Sangria Red, Meteor Silver, Pearl White, Dazzle Blue, Damson Purple and Espresso Brown. On the dimension front, the car measures 3164mm in length, 1750mm in width and 1652mm in height. The wheelbase stands at 2230mm while the 180mm of ground clearance is pretty awesome given the size and category of the car. The interior of the latest version is not devoid of changes. Depending on which variant you choose, the cabin is finished in either beige or black with silver and red or light brown inserts. The mid variants also feature white and silver body colours along with contrasting red outside mirrors. The seats are now better contoured that translates to a comfortable ride. Other than that, there is a chunkier steering wheel, instrument cluster now gets digital clock along with information such as tripmeter and fuel consumption. The most interesting addition is the Bluetooth enabled Amphistream music system with radio, mp3 and Aux-in playback. In terms of specifications, Nano GenX sources its power from the 624cc 2-cylinder petrol engine that produces 38PS and 51Nm of peak torque. The transmission duties are handled by 4-speed manual gearbox while the addition of 5-speed AMT is a boon for congested city driving conditions in India. The car is also available in CNG variant with a bi-fuel (petrol+CNG) option. Talking about the variants and pricing, the Nano is available in 6 different variants. The base model XE starts at Rs. 2.39 lakh while the top end model XTA has been tagged at Rs. 3.29 lakh. The CNG XM model is priced at Rs. 2.97 lakh, all priced ex-showroom, New Delhi. Tata Nano since its launch has been dealing with Maruti Alto and Hyundai Eon. However, over the time with the advent of players like Hyundai Eon, Renault Kwid and Datsun redi-GO, the survival for Tata Nano has become quite difficult. But from commuter hatchback point of view, Nano is still a great car to possess. For the past 2-3 years, Tata Motors has matured itself in terms of designing. This can be seen in the recently launched cars such as Bolt, Zest and Tiago. Compared to the original Nano launched in 2009, there have been drastic changes inside. The dual-toned cabin has really uplifted the ambience and roominess. The dashboard is light in colour and the carmaker has added a couple of glove boxes and space for holding bottles. The steering wheel in the GenX is all-new which has a nice grip. The AC vents with chrome outlining and new instrumentation have raised the quality level a notch. Moreover, the door inserts and seats have improved upholstery and the addition of more plastic across the cabin has helped shunned the basic image of the car. Another interesting addition is the new Bluetooth enabled Amphitheatre music system which also supports radio, CD, MP3 and Aux-In. The system is powered by 4-speakers and also allows phone calls on the go. Other comfort aspects in the new GenX include electric power steering, driver information display including average fuel and distance to empty, remote keyless entry, digital clock LED display, air conditioner with heater and 12 V power socket. What else we want in a budget car? Space definitely needs special mention given the size of the car. Believe it or not, the spacious cabin has always been a unique selling point of the car. The front and rear passengers have enough knee and leg room while the headroom is also excellent given the height of the car. The new GenX nano is undoubtedly has become a cute little car. And this can be seen in the smiling face it has been given. The front fascia features the new smoked headlamps with black surrounds. The headlights are connected via a glossy black strip with the brand logo in the centre. The bumper too has been revamped featuring a smiling grille which Tata calls as ‘Humanity curve’. The grille also houses new fog lamps located on each side. For many, the 12-inch wheels might seem puny but do lift up the aura while the car is in motion. A similar grille design can also be seen at the back while the bumper design has also been altered. The biggest change at the rear is, of course, the addition of openable boot hatch for accessing the boot and storing luggage. The boot can hold up to 110L (94L in AMT version) of luggage while it can be expanded to 500L if the rear seats are folded. The 624cc engine has been tuned to deliver maximum efficiency at minimum fuel consumption. The new GenX manual version is able to deliver ARAI certified 23.9kmpl. On the other hand, the automatic version can return 21.9kmpl, this is because the gear ratios have been tweaked following user feedback. The CNG variant also known as eMax can deliver up to 36km/kg which makes the running cost around Rs. 2/litre. The new Nano sits slightly higher than its predecessor. This is a part of the suspension upgrade which has made the ride quality of the Nano better than the previous model. The AMT handles in the city premises quite well, provided the speed is slow, while the ride is basic and satisfactory at urban speeds. The car continues to run on the same 2-cylinder 624cc petrol engine that produces 38PS and 51Nm of max torque. The engine is paired to 4-speed manual transmission while there is also an option of 5-speed AMT. The automated manual transmission is the same which is working in Zest. The CNG version works on water-cooled multipoint injection system. However, the power is slightly low at 33PS and 45Nm in CNG powered variant. The manual version certainly gives you better control over shifts as compared to AMT, which shows a significant lag between the shifts. Even the sport mode provided in the car is not so impressive when the car is driven with AMT transmission. However, once the car gets the momentum, the AMT is reasonably responsive. Also, the creep function in the automatic variant is beneficial in city stop-go traffic. The brakes do their job fairly and help take stress off the weak drum brakes, keeping the vehicle in better control. However, the AMT version lack that needed a bite. Safety has been the top priority of the carmaker in this major update. The new GenX gets reinforced body structure for enhanced safety. The car also gets impact cushioning crumple zone for limiting the crash energy to the external part of the vehicle. Other than these, you do get central locking, high mount stop lamp, front and rear seat belts and side intrusion beams for better safety. What is the price of Tata Nano? On road prices of Tata Nano in New Delhi starts from ₹ 2.97 Lakh for base variant CNG XM, while the top spec variant XTA costs at ₹ 3.35 Lakh. What are the colors options available in Tata Nano?